Tall, graceful, clean-limbed, elegant- no, I’m not talking about French actresses! Meet some of the world’s most attractive birds- the cranes of India. Cranes are characterized by their long necks and long legs, and all inhabit wetlands or grasslands. It is their dependence on these habitats that has sadly made several crane species endangered today. Sarus Cranes are the tallest flying birds in the world, and are revered in culture as the symbols of marital fidelity. Sarus cranes are also the only resident cranes in India. They are renowned for their elaborate courtship displays, in which the male and the female perform a grand duet with loud trumpeting calls and graceful dancing. They inhabit grasslands and marshes and eat water plants and crustaceans. The species is threatened by habitat loss, hunting and pesticides. (Note: In reality, only the male opens his wings in the duet (as pointed out by Dr. Gopi Sunder of the International Crane Foundation). The female here has been depicted with her wings open only to achieve symmetry in the illustration). The Common Crane breeds in Europe and winters to our region. The bare, red crown, black forehead and lores, and the white streak that extends from behind the eyes to the upper back are characteristic features of the bird. It is an extremely social bird and migrates in flocks of up to 400. 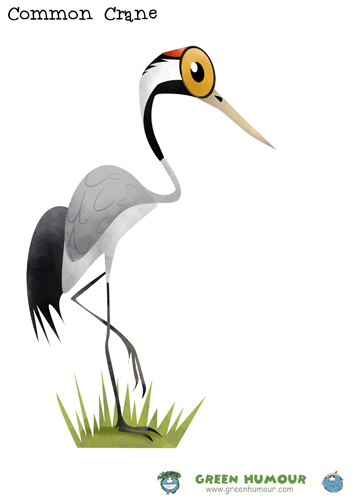 The Common Crane has a special place in Irish culture and folklore, in spite of being extinct there for 200 years. Recently, the bird has started re-visiting Ireland naturally, and efforts to reintroduce the species on a larger scale are being planned. The long, slender eye stripe gives the Demoiselle Crane its characteristic, graceful appearance. Demoiselle Cranes that visit India in winters breed in Central Asia in Mongolia and Northern China. The bird is known as ‘koonj’ in Hindi and is of cultural significance in North India, one of its major wintering grounds. The crane finds itself a part of several important pieces of poetry and literature, and is also a metaphor for beauty in the region. Demoiselle Cranes are also known to make one of the most hectic migratory journeys, crossing the Himalayas to reach India. Black-necked Cranes breed in the Tibetan Plateau and migrate to remote parts of North India and Bhutan in the winter. They are revered in Buddhist mythology and as a result, protected culturally in these areas. As with other cranes, Black-necked cranes are renowned for forming long-lasting pair bonds and are extremely dedicated parents. The species is the state bird of Jammu and Kashmir. The Gangteng Monastery in Bhutan celebrates a Black-necked Crane festival each year in November to mark the arrival of the cranes in the country. Throughout its range, it faces a threat from habitat conversion, agriculture, overgrazing and dam construction, and finds itself listed as ‘Vulnerable’ on IUCN’s Red List. Identified by its bare, brick-red forecrown, and pink legs, the Siberian Crane is among the world’s most endangered crane species. It is threatened by habitat loss throughout its range. Siberian Cranes used to winter in India, and Bharatpur was famous as a favourite haunt of these birds, until 2002, when the species became locally extinct, owing mainly to hunting and habitat degradation. Read more about the history of the Siberian Cranes in India in this article on Kolkatabirds here. For orders within India, the prints of both the individual species as well as the compilation are available as A3 posters, along with a hoard of collectibles- fridge magnets, coffee mugs and personal diaries! Mail me your orders on rohanchakcartoonist@gmail.com (don’t forget to mention your complete postal address and contact details) and take these leggy lasses home!